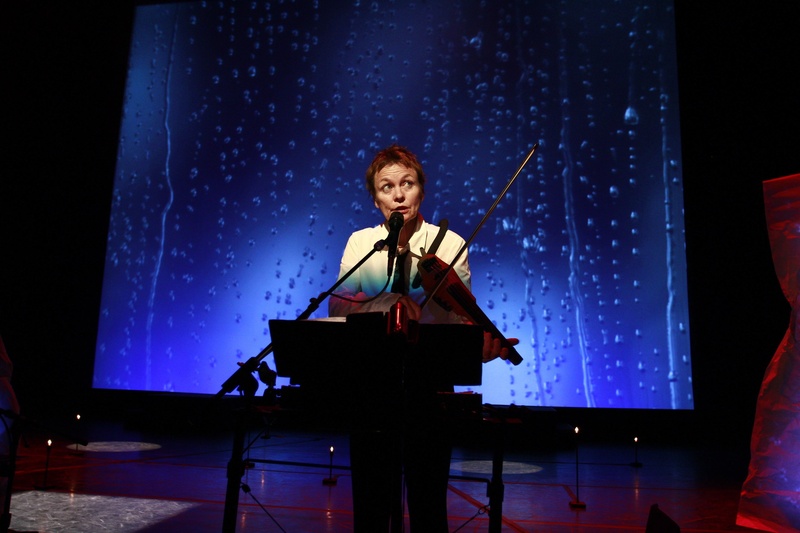 For those who know Laurie Anderson primarily as a recording artist, it’s easy to think of her as a friendly, quirky pop-art celebrity. You know, the one with the pixie face and the spiky hair who’s married to Lou Reed, the one whose most famous song, “O Superman,” is so easy and fun to imitate (“ah-ah-ah-ah-ah”). But to see one of her fully produced theatrical evenings, such as “Delusion,” which recently opened the 28th annual Next Wave Festival at the Brooklyn Academy of Music, is to re-encounter the deep strangeness of what she does. Yes, you can call it performance art, but that overly bland term, which can also be a cynical euphemism for overindulgent multimedia histrionics, doesn’t really do her justice. The visual images tend toward autumnal – the four screens onstage flash with pictures and videos of dead leaves, rain, black-and-white gardens gone to seed – and the musical motives mournful. (Horn player Colin Stetson and violist Ervind Kang accompany Anderson, who summons all kinds of sounds from her violin and keyboards.) Some stories touch on death and dying and the after-life. “They say you die three times,” goes one passage, “once when your heart stops, again when your body is buried or cremated, and then the last time someone says your name.” Some refer obliquely to stormy intimacies that alternate between love and hate. As Anderson leads us through this dreamscape, we can’t help wondering if this is going anywhere in particular. Turns out it is. In “Delusion”’s final story, she consults a Catholic priest with a shocking, brutally honest confession: “I have a problem. My mother is dying but I don’t love her.” In a few deft strokes Anderson captures the wrenching chaos of an unbeautiful hospital death and the eerie psychic drift of not-mourning. Suddenly, all the pieces of the evening come together in an unexpectedly, intensely personal way. If storyteller is Anderson’s primary identity, right behind that is the questioner. Out of the oceanic wash of sights and sounds that add up to “Delusion,” every few minutes a potent question emerges: What is a man if he outlives the lifetime of his god? What are days for? Why is it always raining in my dreams? Dear old God, who are these people? And finally, most poignantly, Did you ever really love me?